are exploring virtual reality as a new medium for performance art. broadcast live at the Western Front. The Avatar Performance Stream has been developed by LIVE Director of Avatar Development Jeremy Turner (Wirxli Flimflam), in partnership with James Morgan (Rubiayat Shatner) [Ars Virtua] and Natalie Loveless (Loveless Finsbury). A special curatorial initiative by Skawennati Tricia Fragnito (xox Voyager) is being developed with the 2007 LIVE Per formance Ar t Biennale support of Aboriginal Territories in Cyberspace (AbTeC). Taking their influences from numerous sources, including Dada, Fluxus, Futurist Syntesi, the Situationist International and contemporary performance artists, Second Front creates a 21st Century Theatre of the Absurd that challenge notions of virtual embodiment, online performance and the formation of virtual narrative. 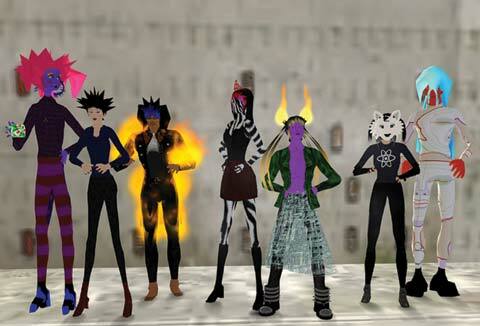 Second Front is the pioneering performance art group in the online avatar-based VR world, Second Life. Created in 2006, they have already performed extensively, including in Vancouver, Chicago, New York, and has been featured in publications including SLate, Eikon, Realtime Arts (Australia), The Avastar (published by Axel-Springer, Germany) and most recently in Exibart (Italy).